If you want to volunteer in verifying the artwork submitted by artists, or become a voluntary translator, please fill out the chart below. If you want to edit the biography of the historically noted master and articles about fine art, you can edit them on the corresponding webpage directly, with no application here. Singing Palette - Artwork exhibition of contemporary artists from different countries! Singing Palette - set up a trustful bridge for global collectors and artists! Singing Palette is established on the base of providing open resources, which is a professional and free communicational platform for art. 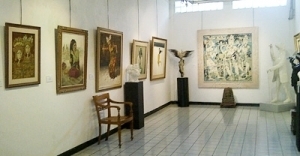 Artists and art lovers can obtain your services free of charge. Singing Palette art website is a manually editing communicational platform containing the most extensive contents of visual arts. Our editors include Singing Palette team, the global voluntary editors, noted art consultants and voluntary translators. Upload the documentations to prove your competence 5MB per image, for JPG, GIF, JPEG, BMP, JEFF only. Please select the first artwork and make comments on it 5MB per image, for JPG, GIF, JPEG, BMP, JEFF only. Please select the second artwork and make comments on it 5MB per image, for JPG, GIF, JPEG, BMP, JEFF only. You have already been over the age of 18. You yourself are the artist of the applied art types (or possess professional translation competence). You have proficient skills in art comments (or grasp relevant professional terms). You have an excellent writing competence. You have confirmed that the information you rendered is accurate and reliable, and you are ready to undertake both moral and legal responsibilities. Please upload the scanned copy of your ID or certificate. You may make mark on some area of the scanned copy to protect privacy.